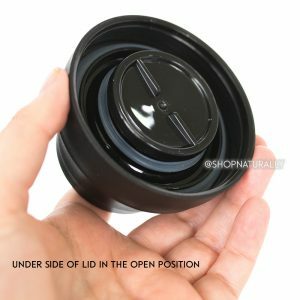 Whether you're talking about water bottles, smoothie cups or reusable coffee cups, there's usually not a huge amount of difference in the performance of the body of the product, but the design of the lid and your ability to pull one apart and replace it when needed should always be a deciding factor in your choice. This month Cheeki, made a significant improvement to the lid on for their reusable coffee cups. 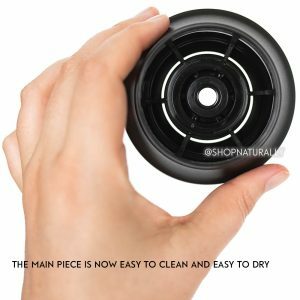 They have always been leakproof in the closed position, but now you can pull them apart and clean them. We took them in to our photo studio so you can see the mechanics and find out how easy it is to pull one apart and clean it. Here's the lid in its closed position. A sticker is on the top of the lid for instructional purposes only. It should be removed fore you start to use it. It explains the simple one finger press in the middle to both open and then close again. In the open position, the centre piece sits lower. 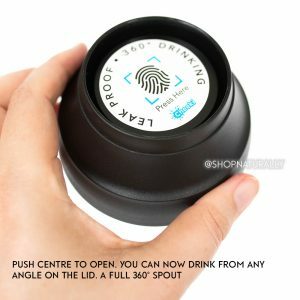 When in this open position, you can now drink from any angle. 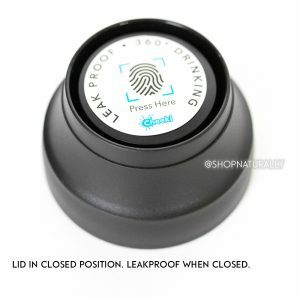 If you sip and drive, this means it does not matter where the drinking spout is, as it's the full 360° around the top. 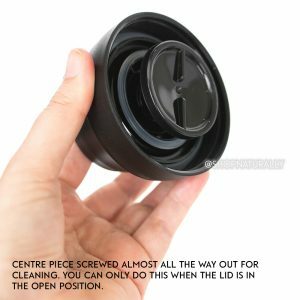 Before pulling the lid apart to clean, it does need to be in the open position, as pictured in the two photographs above. Comparing to the photograph above this one, we have unscrewed the underneath piece almost all the way out so you can see what it looks like as you pull it apart. Completely removed now, this is the only piece that needs unscrewing to pull it apart to clean. 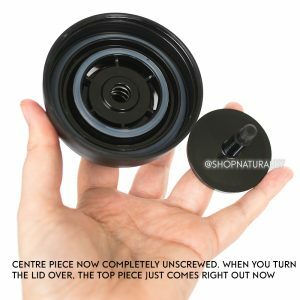 Once you tutn the lid back over, the other piece simply pulls out as it was also being held in place with the same base piece. 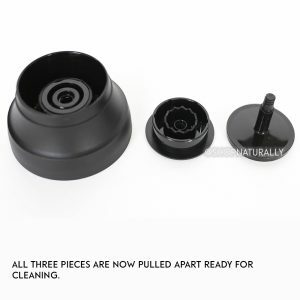 There's no springs or small pieces that will come loose when you do this, it's simply 3 pieces. Each piece is now simple to clean. The piece on the left is the main section that screws on to your coffee mug. The second piece is the top section that you press to open and close (and it's upside down in our photograph). The third piece (the one on the right) is what we unscrewed. This is the main section and as you can see, the middle is where the thread unscrewed and the ring broken up in to 6 sections is where your coffee flows through when the lid is in the open position. Use a small brush or sippy straw cleaner to get in here. Soak in a solution of water and white vinegar to remove lingering smells. Allow to completely try before reassembly. Shop the Cheeki range > cheaper prices than buying direct with full manufacturers warranty.